A mere 20-minute drive north of Mt. McKinley Princess Wilderness Lodge sits a park almost half the size of Rhode Island that is often overshadowed by its larger, more popular neighbor to the north. Denali State Park (not to be confused with Denali National Park and Preserve) is home to 325,240 acres of spectacular landscape, wildlife, recreation opportunities galore and one of the best views of its namesake, Denali. While the national park tops many travelers’ itineraries, the state park is often overlooked, but it’s recreational and scenic opportunities are just as grand as its nearby sibling. Denali State Park is comfortably situated between the Talkeetna Mountains to the east and the Alaska Range to the west, and access to it is as easy as it gets. The George Parks Highway, which links Anchorage to Fairbanks, cuts right through the middle of the park, lending travelers the feeling they have driven into a beautiful postcard. The Alaska Range, the park’s western backbone, can be seen from most areas of the park and right from the deck of the Mt. McKinley Princess Wilderness Lodge. But it’s best seen from one of the five viewpoints right off the highway’s shoulder. The viewpoint at mile 135.2 offers an interpretive bulletin board with explanations on the surrounding mountains and, weather permitting, has the best view of the Alaska Range. Lowland streams and alpine tundra make up the park’s diverse landscape. Another fantastic place to experience the grandeur of this place is at the top of Curry and Kesugi ridges, 35 miles of alpine ridge accessible from four different trail heads: Lower and Upper Troublesome Creek trailheads, Little Coal Creek Trailhead and Ermine Hill Trailhead. The trailheads are all located along the Parks Highway. Unlike the jagged peaks of the Alaska Range, tundra plains that make for relatively easy hiking surround the trail atop Curry and Kesugi ridges. The Tour Desk at the lodge offers a guided hike up the ridge with explanations about the area, its history and the many wildlife species that inhabit the park. You can also combine the hike with a paddle through the pristine waters of Byers Lake in a single or tandem sit-on-top ocean kayak and share the water with trumpeter swans, loons and beavers. Denali State Park’s many clear streams offer great fishing opportunities. Look for all five species of salmon, rainbow trout, arctic grayling and Dolly Varden in the park’s streams and, in smaller numbers, in Byers, Spink and Lucy lakes. Burbot and whitefish can also be found in Byers Lake. Go on your own or book a sport fishing tour at the lodge. One of the park’s popular tours leaves from the town of Talkeetna, the starting point for Denali climbers and a fun stop for any visitor to the region. 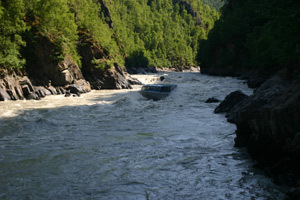 Book the Devil’s Canyon Adventure through the lodge, board the boat in Talkeetna and relax as it floats through the state park and into Devil’s Gorge, a nationally registered wild river park. This isn’t your run-of-the-mill slow-paced river excursion so prepare to be bumped around as the boat makes its way into the canyon and meets Class V whitewater rapids. The 44-foot boat travels 65 miles up the Susitna River and stops for lunch and a short hike accompanied by stories of early settlers and Alaska Native remedies that made use of the local vegetation before returning. Dress warmly and bring a camera to document any wildlife encounters. Another fun way to see the park is to take a horse-drawn wagon ride just like the pioneers did. From the wagon’s bench, the backdrop of Denali, glaciers and valleys create an unparalleled panoramic view. Every seat is the best seat in the house on board this wagon. Half way through, the tour stops at a fire pit where passengers roast s’mores and listen to stories about the gold rush era and the park’s geology. Other guided activities available through the lodge’s Tour Desk include ATV rides, flightseeing, an Alaska Survival Tour, Chulitna River Rafting and the Trapper Creek Homestead Tour, to name just a few. 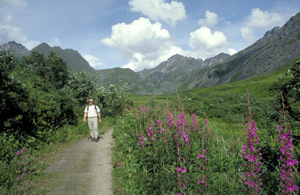 To see a full list of activities available in Denali State Park, visit Mt. McKinley Princess Wilderness Lodge.